The first collaborative effort from The High Desert Museum and At Liberty, the new cultural space that recently opened in the historic Liberty Theater, showcases a rich and compelling look at the natural world from six Oregon artists. The artists—Andrew Myers, Michael Boonstra, Nancy Watterson Scharf, Monica Helms, Kendra Larson and Craig Goodworth—utilize a variety of mediums to celebrate the diversity of flora and fauna while simultaneously commenting on the very real concerns about its destruction. "This exhibition represents the museum's commitment to community outreach and offers the public an opportunity to experience contemporary art in historic downtown Bend," said Andries Fourie, the museum's curator of art and community engagement. The show will be on display through December. A reception, with the artists present, will be held during First Friday in December. Longtime Bend artist Chris Cole currently has a retrospective of his work on display at Central Oregon Community College's Pence Gallery at the Pinckney Center. 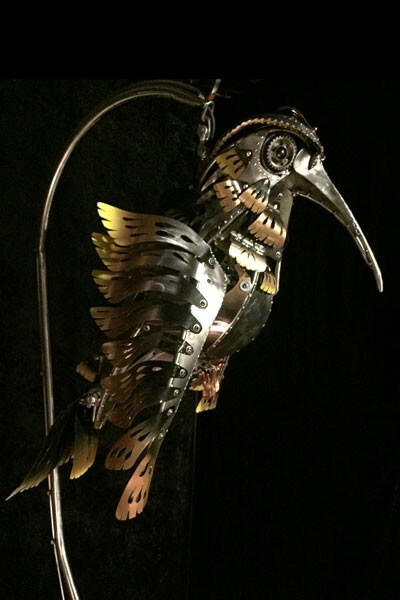 Cole is probably best known for his kinetic sculptures made from discarded bicycle parts and other scraps of metal. He often turns this junk into fun, exciting large-scale sculptures of bird, fish and more. Many of his sculptures light up and move, and often you can even see the gears working and clicking. His work brilliantly combines the love of the natural world with the inevitableness of the industrialized one, reminding us of our role in the discarding of waste and our role of protecting the beautiful lands we belong to. BendFilm Presents "A Place to Stand"